The more we play with the Apple TV, and the more Apple updates it with new features and new software, the more we like it. But the problem is that unless you've got at least one Mac or iOS device, it's simply not something you'd want to buy. This latest version is a perfect example of that. New 1080p features and a new interface will be enough to attract Apple fans, but for anyone else there are simply better, cheaper options out there. Still though, we've enjoyed our time with it and it's been fun to test it alongside some of Panasonic and Sharp's 2012 TVs this week. The Sharp in particular offers stunning value for money – so if you're looking for a great home cinema TV on a budget, be sure to check out the review below! 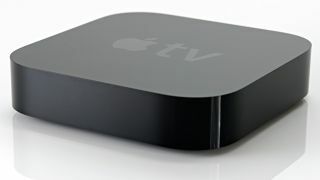 Apple TV hasn't changed much in function since the first version emerged in early 2007. But in form, it has changed significantly and this latest release is better than ever. It's really only when you own an iPhone, iPod touch or iPad that owning an Apple TV makes the most sense. All Apple's devices know how to play nicely with each other, so you can use an Apple TV to mirror the screen of your iOS device and have everything it displays appear on your HD television. But if you don't already own an iOS device, even with the addition of 1080p HD, there's no compelling reason to buy an Apple TV over other media streamers right now. The Toshiba AT200 is a good, solid and delivers everything you'd expect from an Android tablet. However that's all it is - another Android Tablet in an already crowded market. So we can't help thinking that Toshiba has only done half a job with the AT200. It looks great, we love its thin, lightweight and well connected body – but when you get to using it you're not wowed by anything. Toshiba has made a competitive tablet, a marked improvement on the AT100, and it will certainly give the established dual core Android 3.0 tablets a run for their money. But it's still nothing special. On paper, the Sharp Aquos LC-60LE636E sounds too good to be true. Being able to get a 60-inch screen from a respected brand for £1,300-2,600/$2,000-4,150 pretty much rewrites the big-screen pricing rule book. The screen isn't nearly as basic with its specification as you might expect either, managing to include extensive picture calibration tools, 100Hz processing, multimedia playback from USB sticks and DLNA PCs, and even a degree of online functionality. It looks very pretty too, putting to shame the bland plasticky finishes of your typical budget TV. However, tragically much of its excellent work is undone by a single but aggravating flaw: noticeable and distracting backlight consistency during dark scenes. Why is Panasonic offering an Edge LED alternative to its plasma TVs? Given that the latter performs peerlessly with 3D and nicely upscales lesser-than-HD sources, the choice of Edge LED is surely all about the innate slimness it brings. There's no doubting the Panasonic TX-L42ET50B's style, but is it over substance? There's no escaping the fact that this is an expensive TV, despite it being Panasonic's biggest ever Edge LED TV. It may have sacrificed plasma at this living room-friendly size, but its love of active shutter 3D tech refuses to budge. It's a strange move that leaves the Panasonic TX-L42ET50B neither a slim and cheap option nor a high-end home cinema screen, although at its best it's just capable of surviving in either environment. By turning cores on but turning overclocking off, this eight-core Xeon is a zero sum game. As expected it's just not cost effective on the desktop, but still puts into question why exactly we don't have a full eight-core desktop processor in the desktop Sandy Bridge E family. One thing's for certain; it's not a technical limitation.